Be warned, this is a long one. I like to think of myself as a calm mum who is quick to laugh. I try to be organised so we can take family life easy and have fun. Shower first. Is it just me that always thinks I can hear one of my children crying when I shower? Every day I religiously get out to check and of course and all is fine. Expect for yesterday. I could hear something but not my children. Well, not only them. Every burglar and fire alarm in the house (there are many) was going off. Great for my pudding’s earache. I pulled on pyjamas, carried the girls downstairs, wrapped them in a blanket and put them outside the front door where the ringing was quieter while I tried to stop it. To no avail. I stood outside with them feeling light headed (& wet and cold having leapt out the shower) And then I saw the van with my weekly shopping arrive. Twenty odd plastic bags in the front garden plus me and two cold kids. No pancakes, no morning cuddles, no laughter and sunshine. Instead a stressed mama. And a very loud ringing. By the time I fixed the alarm (well, an engineer did that later in the day but I did stop them ringing) we were in a tearing hurry. We do not thrive under pressure in the morning. I asked some of my sage WornOut friends if 8:30 was too early for wine. My sister offered rather helpful advice, “a nip of brandy in your coffee is much more refined”. There is nothing unusual at all about ordering a caffè corretto first thing in the morning in Italy. Not so in my local Costa. Anyway, I digress. Loud noise was a feature of the day. La Bambina loved her music class and I did smile as three other babies tried to grab her rather lovely shoes. She was not impressed and resorted to the fail safe of covering them in slobber to keep other mitts off them. Lovely. She wore Ruby & Ed magenta slippers. I wore very old M&S snake print leggings (and shouldn’t have), Cos heavy roll neck A line dress, Mango furry gilet, Cafe’Noir grey boots. Today I am feeling the love. It is Valentine’s Day after all. Until I had kids I don’t think I’d ever celebrated Valentine’s Day. I quite like it now. 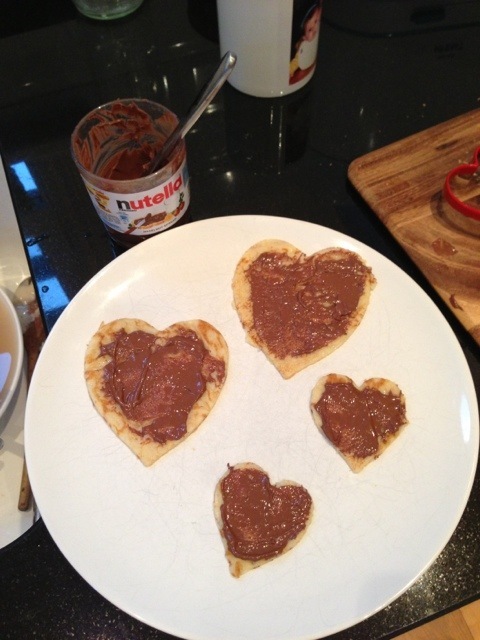 We had heart shaped pancakes with chocolate spread for breakfast and my beautiful girl gave me three poems she’d “written” in English, Italian and French (we don’t speak French) So young and so romantic. The words changed every time she read them to me but they all referred to my provision of chocolate being very loveable. I’ve spent a long part of the day watching La Bambina chase a plastic flashing noisy rolling toy across the floor. Later I will be cooking a gourmet meal of spaghetti carbonara followed by pannacotta with chocolate sauce for my smallest beloveds (then crab and lobster for us grownups) I am Baby Led Weaning La Bambina and her introduction to spaghetti will be interesting. An important moment for any Italian. Very old Oasis jeggings I’ve just rediscovered, blue tunic from Zara and black Ash Jalouse. Ha ha – leggings and a tunic, get me! Hope you’re all feeling, and more importantly getting, the love. This entry was posted in Outfits and tagged Ash, Cos, Mango, Oasis, Ruby and Ed, Zara on February 14, 2013 by Eve WornOut.